Since there is currently so much talk about liquid mesh i thought maybe i put together some substantial facts about this topic. So, what is Fitted mesh, Liquid Mesh, Flexi Mesh, Redpoly mesh, weighting to Collision volumes , … ? These and a few more terms are flying around since some time. But actually all these things describe the very same basic technique, that is:Weighting the avatar skin to the “Collision Volumes”. Avastar also uses the up to date Character definitions from Linden Lab. So it should be well prepared. Please download the newest Avastar version from the Testversions subfolder of your personal download page. Rig your attachment to the default Avastar character. If for ANY reason you wish to test fitted mesh on the Avastar character, then freeze first!!! or when you attach the Avastar meshes them self to the Sliders, then you will get a disaster. What is the “original” purpose ? The Collision Volumes are used as very simplified model of your avatar shape. 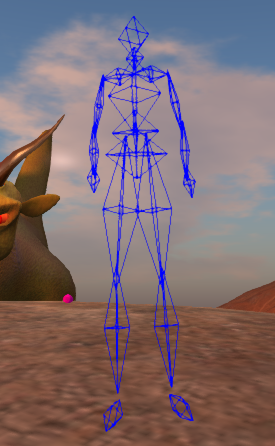 This simplified model is “officially” used for calculating the collisions of your avatar with other objects and characters. They have an adjustable length (from tip to tip) and thickness. Their shape is modified via the SL shape sliders. Thus the set of Collision Volumes always gives a rough approximation of your Avatar shape. This approximation is enough to calculate interaction of your avatar with other objects and characters. How is all of this related to Liquid Mesh ? Technically the collision Volumes have been implemented as (hidden) Skeleton bones. Since every bone can be weighted, this is also true for the collision volumes. And as a lucky coincidence the change in thickness of the collision volumes is transferred to the avatar skin (when the collision volumes are weighted).So it is this discovery that made “Fitted Mesh” come to live and work as you can see in all “Fitted Mesh products”.